Please feel free to check out Renee's ~True Fans of Dale Earnhardt~ community. COULD HE WALK ON WATER? COULD HE PART THE SEAS? THAN A MERE MORTAL MAN? Yet the pain of losing Dale for many still lingers on. And shed a tear in sorrow for their hero, the Man In Black. The high banks of Daytona the Intimidator will race no more. When he takes the checkers now victory lane has angels who sing. He races on a different track now where Ralph's the father and he's the son. They race not for fame and fortune but to bring honor to his name. And missed the hug in victory lane from the man with the sly dawg grin. It was a different color, a different number, but the team was still RCR. He carried the flag of the black number 3, his competitor and his friend. Others continue on and feel Dale would want it that way. 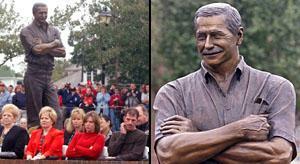 The man from Kannapolis, Dale Earnhardt, will live forever in our hearts. I miss him so much. Thanks and hope you enjoy the poem. If you look for a role model, look to her and say "amen"
Is that it’s still not the same, watching those cars go. The yellow number 1, but the 3 is unseen. Different driver, different car running that line. He left us so swiftly, not even time for a good-bye. Within the hearts of fans he will always reside. Love him or hate him, he was always The Man. And I for one will be forever a fan.